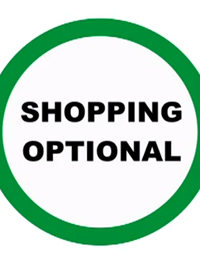 This video was released to promote the party’s 2011 election plank: End Forced Religious Observance: Choice in Shopping . 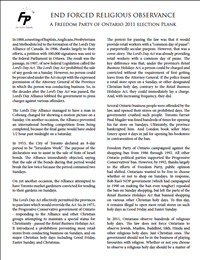 Freedom Party of Ontario’s 2011 Election Plank: End Forced Religious Observance. “In 1975, Ontario’s Progressive Conservatives introduced legislation that fined some retailers, and sent others to jail, for opening their stores on Christian holy days such as Good Friday and Easter Sunday. The law remains in force to this day. A 2011 election plank released today by Freedom Party of Ontario calls for the elimination of forced religious observance…” Click here to read the full media release. 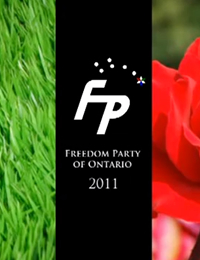 April 19, 2011 – Radio Interview: Freedom Party leader Paul McKeever was a guest of the John Oakley Show (AM 640 Toronto). The topic: Dalton McGuinty’s ban on herbicides and pesticides, and Freedom Party of Ontario’s promise to eliminate the ban. Click here to listen. On the John Oakley Show (AM640, Toronto) Paul McKeever, leader, Freedom Party of Ontario discussed Dalton McGuinty’s ban on herbicides and pesticides, and Freedom Party of Ontario’s promise to eliminate the ban. This video was released to promote the party’s 2011 election plank: Eliminate Dalton McGuinty’s Pesticide Ban. 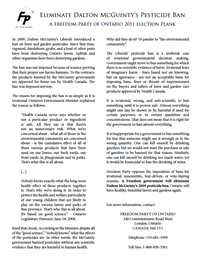 Freedom Party of Ontario’s 2011 Election Plank: Eliminate Dalton McGuinty’s Pesticide Ban. “On April 22, 2009 (Earth Day), Premier Dalton McGuinty’s Liberal government introduced a ban on a wide range of lawn and garden herbicides and pesticides. 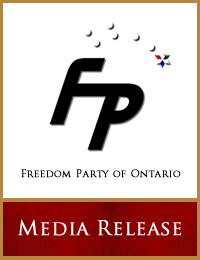 A 2011 election plank released today by Freedom Party of Ontario calls for the elimination of the ban…” Click here to read the full media release.